Which?, the impartial consumer champion organisation, has launched a hard-hitting print campaign highlighting the government’s slowness to act on improving product safety. The ad – created by Grey London - implores the government to take urgent action on improving the existing not fit-for-purpose product safety standards for domestic electrical goods. The government has accepted the findings of an independent review body but has been slow to implement them. 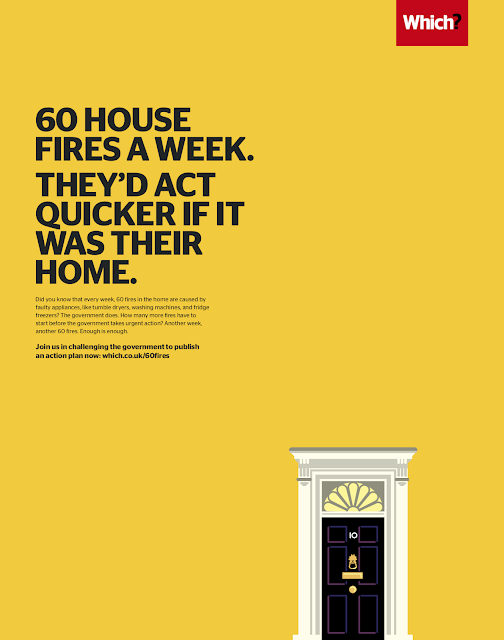 With 60 house fires every week caused by faulty appliances, such as tumble dryers and washing machines, the ad says that enough is enough and asks whether the government would be quicker to act if it happened at Number 10. It invites readers to challenge the government to publish its action now by signing up at which.co.uk/60fires.